CD reviews: "Now," "The Gospel According to Jazz, Chapter 1," "Coltrane's Sound," "Oh Yeah," "The Clown" and "Art Blakey's Jazz Messengers With Theloniouis Monk"
These reviews first appeared in the May 29, 1999 edition of the American Reporter. Meet John Patitucci. Odds are good you've not heard of him. He plays the bass; plays it quite well. In jazz circles, he's a well respected musician who gets lots of work. He's recorded a handful of albums for the independent Concord label. Nice albums, good reviews. But his most recent album, which came out last fall, is a mindblower. Patitucci put together a great band for this session: John Scofield, who is a monster on guitar. Michael Brecker and Chris Potter on saxes. Bill Stewart on drums. Gotta admire a player brave enough to himself in such company, especially on a recording that will have his name on it. Scofield and Brecker, especially, push him song after song. And he pushes back. Meets the challenge. Throws a little more back in their faces. Challenges them. Ends up with some of Scofield's best playing ever, and this on an album with Patitucci's name on it. The result is one of the finest and most exciting jazz albums of the last year, an outstanding hour-plus of straight-ahead sounds and top-rank soloing. 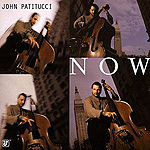 Meet John Patitucci. Odds are you'll be hearing more from him. 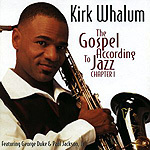 Who knew Kirk Whalum had it in him? Since the early '80s, the saxophonist has carved a lucrative niche for himself in the "light jazz" arena, mining the same easy listening territory as Kenny G and Spyro Gyra. But Whalum's latest project, "The Gospel According to Jazz," is a powerful, artistic statement, every bit as challenging and visionary as Wynton Marsalis' "In This House, On This Morning." Where Marsalis' jazz liturgy was in an Ellingtonian vein of a jazz interpretation of a high Mass, of a certain European sense of formalism (albeit far more avant-garde than the Duke ever approached), Whalum's creation is firmly in the Southern Gospel tradition. This is more along the lines of contemporary gospel music set up in a jazz structure. Whalum's career in pop music has given both his lithe playing and his gospel-oriented compositions the kind of uninhibited joy one finds in the local holiness church. The choir is inspired, the arrangements swing like crazy, the songs are melodic. The only other jazz liturgy that approaches Whalum's for combining art and accessibility is the annual "Bending Towards the Light" jazz nativity each year in New York (and captured in disc by Milan Records in 1996). Like the jazz nativity, Whalum's jazz Gospel is also unabashedly Christian. Whalum and his fellow musicians are testifying here, witnessing their faith. In his liner notes, Whalum makes no bones about it: The man is a believer, and this album is a musical statement of that faith. No surprise, then, that given the power of his inspiration the result is the most riveting and lasting recording of his career to date. The late '50s through mid-'60s were not only one of the defining eras of the Jazz Age, they were also one of the most exciting. Ideas were flowing as abundantly as the music; theorists intermingled freely with players, crossover between classical and jazz was seen as the norm. It can, frankly, be a bit hard to remember the sense of excitement and discovery of that time. Heck, most Americans were not yet born when Mingus and Trane and Miles were turning the musical world upside down. For us, the sense of excitement and discovery about this music was more personal, when we heard our first Monk LP, for instance. First found a late-night radio show playing Ornette. First read one of Nat Hentoff's books about the whole scene. No matter whether your experience of that era was first-hand or more distant, Rhino Records' reissue of some of those groundbreaking recordings from the Atlantic vaults is an event. Four more in the series, the second batch, have just been released: Two by Charles Mingus ("The Clown," "Oh Yeah"), "Coltrane's Sounds" by John Coltrane, and a real treat, a 1958 collaboration between Art Blakey's Jazz Messengers and pianist Thelonious Monk. As with the first batch (which featured Mingus, Roland Kirk, Ornette Coleman and two by Coltrane), these reissues are lavish productions. Each disc is housed in a sleeve that is a reproduction of the original LP jacket. That sleeve is inside a heavy card stock folder that protects the sleeve and also holds a booklet of liner notes and photos. Not only do you get the complete original liner notes, but an updated look at the recording in question by such noted writers as Nat Hentoff (who also wrote many of the original notes) and Kenny Berger. Reading fresh essays from Hentoff is a special treat as he's written little on jazz the last few decades, devoting himself instead to social issues. Each disc also contains extra tracks not on the original releases, but taken from the same sessions (often alternative takes of the same songs). Of course, Atlantic wasn't the only label during this historic era, and these reissues present only a small slice of what was going down. But the albums presented so far are the cream of any crop. You don't listen to these discs out of historic interest  at least not for more than a few minutes. These recordings remain incredibly vibrant and entrancing; they demand your full interest in listening to them. The compositions intrigue, the solos enchant. After hearing music of this caliber and imagination, it's hard to go back to listening to most of what has been recorded before or since. Not that the musicians of other eras haven't been as talented; it's simply that when jazz was in its most explorative period, there was a sense of creativity and possibility  indeed, of magic  that you're lucky to get once in a lifetime.